You’re scooting along just fine on the 21 Day Fix. You’re feeling great, you’re losing weight, and you’re headed towards your goal. NOTHING CAN STOP YOU. And then…screeeeeech. The weight loss train comes to a quick and joltingly unpleasant halt. Damn that weight loss train, right?! The truth is, we’ve all been there. We all hit that plateau, and have to find a way to break through. We get this question a lot in our 21 Day Fix Facebook group. Here are some tips for cutting through that 21 Day Fix plateau. Before you start stressing (I know…too late, right?! ), rest assured that this is normal, and going back to eating junk food and not exercising is not the answer. So stay the course, y’all. You’ve got this! And don’t forget – muscle weighs more than fat. Let the mirror, your measurements, and the way your clothes fit be the judge here. Are you strictly following the plan? We all like to think we’re following the plan, but how closely are you really? Spend the next three days measuring and writing down every single thing you eat. Maybe your measurements are slipping if you’re trying to eyeball them. Or maybe you’re subconsciously snacking on the kids’ lunches as you put them together at night. Take a step back and evaluate your eating habits. I use one of my 21 Day Fix journals to write it all down. You can also use an app. Becca has some great free tracking printables, too. Just make sure you’re tracking it somewhere other than your head. Let’s talk about measuring some more. Make sure you’re measuring everything – especially those teaspoons! Are you eating Fix-approved foods? In our FB group, we always see people asking what containe to put unapproved foods in. The truth is, we all have to make little tweaks and adjustments here and there. But if you’re going to eat foods that aren’t on the approved foods list, you’re not going to get the results you want. Period. Check out the updated 21 Day Fix foods list here. Are you using too many treat swaps? It’s easy to lose track of all the treat swaps – make sure you’re tracking how many you have each week. Are you eating all your containers? You need to eat all your containers. Don’t try to drop a container to see if it will help you lose weight – they’re there for a reason! See Autumn talk about this in this video. Do you need to go down a bracket? If you’ve lost weight and you’re still eating in the old bracket, this could be the problem. Check in every so often and make sure you’re using the right container bracket for your current weight (not your old weight, and not your dream weight – your CURRENT weight). Are you getting your workouts in? You can lose weight on this program without doing the workouts. But if you’ve been doing them and suddenly quit, you’re not burning as many calories anymore. Eat from the top of the list. 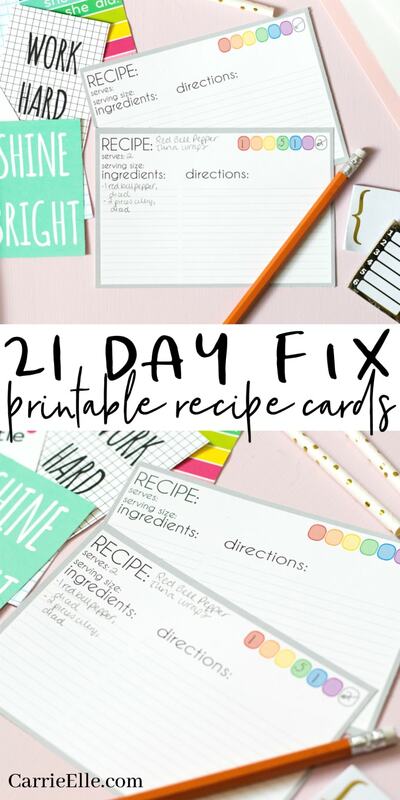 Download the 21 Day Fix Updated Foods List, and make it your Bible. Eat from the top of the list to get the healthiest foods possible. The foods are often changing – you can get the latest, unpublised updates here. And you’ll find more great “how to count this food” FAQs here. Drink more water. Are you drinking enough water? If it’s possible that you’re not, up your water intake. Here are some water recipes to inspire you to drink more. Switch up your workouts. You might need a more challenging workout, or even just a different one. If you have Beachbody on Demand, you can pick from any of the workouts. If you’ve been on the Fix for awhile, you might be ready to bump it up to 21 Day Fix Extreme (which has tougher workouts and a little more dialed-in eating plan). You can read about my experience with the 21 Day Fix Extreme program here. Monitor your salt intake. Salt is technically “allowed” on the program, but it shouldn’t be a free-for-all. Take a good hard look at the foods you’re eating, and how much salt you’re adding. Try going without any extra salt for three days and see what happens. Cut out the bread. You still need to eat your yellows! But go for a sweet potato instead of a whole wheat waffle. Try it for a few days and see what happens. Meal prep. It’s easy to slip up and not even know it when we eat on-the-go or whip something up real quick and then run out the door. Try meal prepping for a week and sticking to your meals. Get more rest. Sleep is so important! Every weight loss book I’ve read (and I’ve read a lot) talk about sleep and how important it is. Get. That. Sleep. Stay the course. Don’t quit, you guys! Don’t quit. See this through. YOU’VE GOT THIS. If it’s early on in your journey (within the first few rounds), read this post about tips for surviving the Fix. These tips can help set you up for success and will give you some insight into what to expect on the program. It might even help you stick with it if you’re struggling. Beachbody has some tips for breaking through a plateau, and they also tell you why you might be experiencing one in this post. I recommend reading it! And my friend Teresa, who has lost 55 pounds on the Fix, shares her story and struggles here – including some very honest self-checks she had to make along the way. Definitely read this if you need some inspiration. I hope something in here helps you out! I’d love to know how you broke through a plateau – let me know in the comments below! And be sure to join us on Facebook for tons of 21 Day Fix recipes (like the ones below). How long have you been doing 21 day fix? Do you do Beach body on demand also? I’ve been doing the 21 Day Fix off and on for about two-and-a-half years. I’m coming back from a cruise this week, so tomorrow I’ll be back *ON* the Fix. I really love the program. I don’t do Beachbody on Demand at this moment, but I’m buying it for myself for Christmas (I did it for the 30-day trial and it was awesome…but that month was tight financially, so I canceled it with plans to buy for my birthday/Christmas). Beachbody on Demand is fun because it includes alllll the programs and workouts.